Introducing the Baby’s First Buddies pattern! 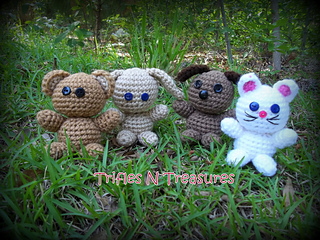 Instructions are included for all four of these darling little buddies~Teddy Bear, Bunny, Puppy, and Kitty! Simple color changes will get you a Panda, Tiger, or even a Koala! Measuring at just 5” sitting, or 6” standing, these little buddies are a perfect size for YOUR little buddies! Many optional ideas included for embellishment, too!